The Mazda was obviously much cheaper, completely loaded, and really fun to drive. In hindsight I would have been far better off spending the money on the more reliable BMW. 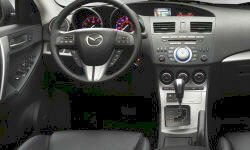 Why the 2010 Mazda Mazda3? Second generation styling most call 'shockingly ugly'.. therefore I must have. I like to look different than everything else on the road. Gorgeous interior and very comfortable on long trips. My car is top-of-the-line decked out with leather, power everything, 10 speaker bose stereo system, bluetooth, navigation etc.etc. 2.5L non-turbo is fun, but I should have waited for the turbo. Avg. 27mpg over the past two years. Awesome, until things started to go wrong.. now it shakes and vibrates all over the place. Mazda dealerships are TERRIBLE and really don't want to fix anything. 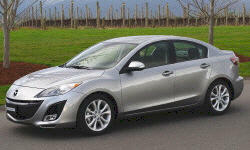 Why Not the 2010 Mazda Mazda3? Decent value, but too expensive considering the drivetrain problems I have experienced. The stock tires are crap - they lasted about 30K miles from new. The drivetrain reliability on this car is awful. Clutch started failing at 40K, axles have gone bad, wheel bearings have gone bad, suspension has been replaced..
Mazda dealerships are the worst of the Japanese car options. The techs are terrible, they really don't know what they are talking about. "Oh, you say the car wanders on the road? That's just because the power steering cannot figure out what way you are trying to steer and it's normal." I'm not kidding! Based on my experience with Mazda, I'll never purchase one again. I replaced lower motor mount with "harder" after market mod. This improved drivabilty tremendously. Gone was the wheel hop around left hand corners and increased straight line traction. Interior HNV increased abit but gone once in second gear. I also installed front and rearshock tower braces which again improved drivabilty esp on tight merging approaches and much reduced body roll. A bunch of fun from a reliable vehicle.